The folks from Calamity Ware are doing their 10th Kickstarter. Artist Don Moyer is known for making traditional white China with a blue glaze and outlandish designs. I kinda love that, at first glance, the items are traditional and wholesome. But, upon closer examination, you find monsters and killer robots and things on fire. I’ve admired his work for some time now, but I don’t use real plates for most things. I am a fan of paper plates I can throw away when I am done, rather than filling the sink with disaster. But this time around, Don Moyer is making nice porcelain mugs. Even though I drink iced coffee when I drink coffee and I am currently on the wagon, I still like mugs. Mugs are good for many things, including heating water for chocolate milk substitute and consuming petite quantities of chicken soup (which I heart making from scratch.) So, yeah, I think I need a set of 4 mugs that say: Things could be worse. I didn’t even have to use my AK. 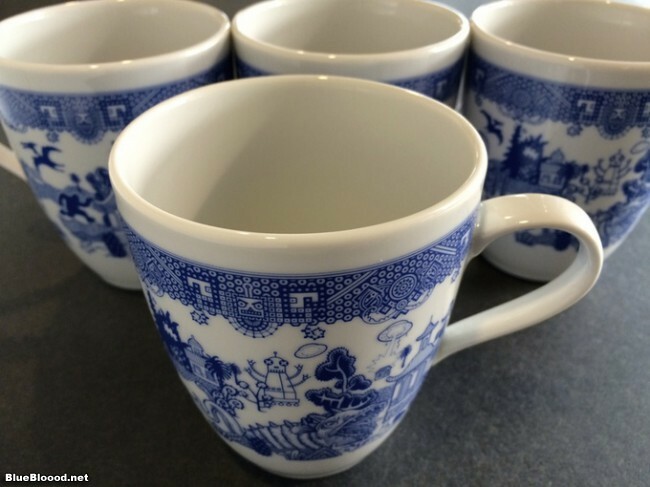 No matter how bad your day is going, these beautiful porcelain Calamityware mugs graciously remind you things could be much worse. Lost your keys? Lost your job? Look at the bright side. At least you’re not plagued by pterodactyls, pursued by giant robots, or pestered by zombie poodles. Life is good! The Things-Could-Be-Worse Mug is designed to remind you how lucky you are. Does the internet make embarrassing pals better or worse? These incredible porcelain mugs would be great to drink tea out of while you enjoy the crazy artwork on them!